Mighty Blaster Reviews: Does it Work? • Handle may be uncomfortable with extended use. • Pressure may not be acceptable to some consumers. Mighty Blaster is an As Seen on TV hose nozzle which is advertised as a way to create a powerful stream while using less water. Initial customer reviews appear to be someone underwhelming to those who have used it. Mighty Blaster is a spray nozzle which is advertised as a way to produce a powerful stream while using less water than traditional hoses. Does it work? Mighty Blaster is advertised as a “Fireman’s Nozzle” which is made from aircraft grade aluminum which is said to produce a powerful stream that can be used to clean siding, vehicles, or driveways. 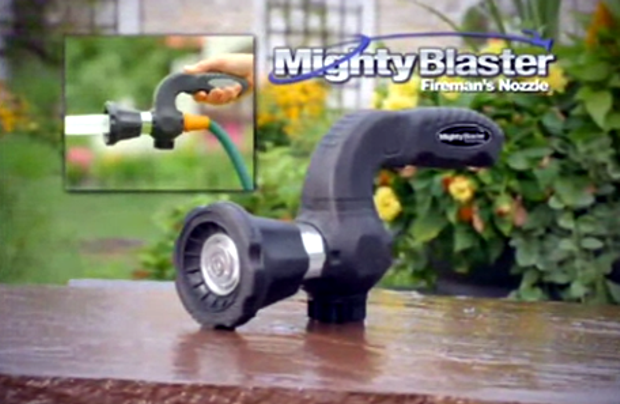 The television commercial describes Mighty Blaster as a sort of hybrid hose nozzle and power washer. “The first-ever household sprayer with the power and precision of a real fireman’s nozzle,” the advertisement claims. The official product website is mightyblaster.com, and it is marketed by As Seen on TV giant Telebrands. That website is no longer working, as of this May 2017 update. If you purchase online from the manufacturer, Mighty Blaster will cost you $19.99 plus $7.99 shipping for a cost of $27.98. There is an offer to get a second nozzle and a Pocket Hose Ultra for an additional cost, depending on the length of the hose you add ($12.99 to $39.99). Shipping can take 3 to 6 weeks. Mighty Blaster is available in stores such as KMart and Target for $6-$10. You can find it either in the As Seen on TV section or the lawn & garden areas. The television commercial below has been airing for Mighty Blaster as of this writing, May 2015. Although Mighty Blaster was briefly marketed in 2014, it was heavy marketed in mid-2015, as spring is the most competitive advertising season for lawn and garden products such as this. The first round of reviews for the product began trickling in around April and May 2015, and the consensus was initially about a 2-star rating, based on hundreds of user ratings we have evaluated here. It is better than a standard nozzle, although it may not live up to the hype. Those who don’t like it say.. It does not create more pressure than a cheap hose nozzle. The design of the handle could cause wrist pain with extended use. By 2017, Mighty Blaster could be found in stores for about $6-$10. The on/off knob has since been removed, but it is otherwise the same as the original version. Advertising claims that it produces an impressive jet can’t really hold up to tests against standard nozzles, as seen below. It’s certainly not bad, but doesn’t outperform a standard nozzle. Although Mighty Blaster is no longer specifically marketed, it has been bundled in with the Hercules Hose as an add-on item. Hose nozzles can be found at virtually any store with a lawn and garden section. There are over 30,000 matches for “hose nozzle” on Amazon, with some of those products being very highly rated among hundreds of customer reviews. You can also find Mighty Blaster on Amazon, where it holds somewhat lukewarm reviews. You may want to peruse comments there, keeping in mind that the price and design have slightly changed over the years. Below is a 2017 review of Mighty Blaster versus a couple of other nozzles. Mighty Blaster is an As Seen on TV hose nozzle which is advertised as a way to create a powerful stream while using less water. Initial customer reviews appear to be someone underwhelming, as the product has not impressed those who has used it. Have you used Mighty Blaster? Please give it a star rating above and leave us a brief comment below.